Penticton, which originates from the Salish and means "a place to live forever," lives up to its name in beauty and ideal surroundings. Nestled between the shores of two lakes, amid the semi-arid countryside of the Thompson Okanagan's wine country, Penticton is one of the top destination spots in the Okanagan Valley. Linked with Kelowna and Osoyoos by well-paved roads to the north and south and an easy drive from British Columbia's largest city, Vancouver, Penticton has just about every amenity needed within reach. skiing, boating and swimming are favorite activities on Okanagan Lake and Skaha Lake, which have a combined length of more than 80 miles and are bordered by numerous hiking trails. There also are at least a half-dozen wineries within driving distance from Penticton, which is a central location for the spring and fall wine festivals. Penticton's origins as a sleepy rural town are long gone, replaced by the nightlife and attractions of a bustling lakeside resort. The city's convention center and casino combines full-service meeting facilities, a casino and luxury accommodations under one roof. 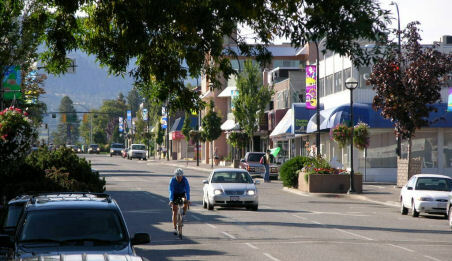 Penticton also has a vibrant arts community and is a regular stop on music and entertainment circuits during the summer. Local popular festivals, such as the Pentastic Hot Jazz Festival, the Beach Blanket Film Festival and the renowned Peach Festival have made this city of 41,000 a popular stop during summer vacations.